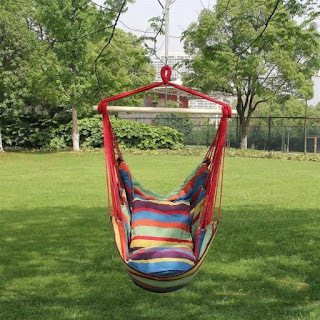 Head over to get this Hanging Rope Hammock Chair for ONLY $24.99 (Retail $45)! This hanging chair, along with its ultra comfort, also acts as a nice decoration for your house. This Distinctive Cotton Canvas Hanging Rope Chair with Pillows brings great softness, durability, and comfort. It has strong strength for supporting up to 250 lbs. You will never regret if you buy this offer!